This scrumptious Green Goddess bowl is warm and nourishing while simultaneously utilizing fresh salmon and the cherished flavors of spring. Spring is in the air and brightly-colored veggie dishes are finally making their revival. This green goddess potato salad with seared salmon is the perfect bridge between warming winter dishes and cooling summer meals. The combination of the seared salmon, crunchy vegetables, and creamy potatoes makes it light and refreshing while simultaneously filling and nutritious. We’re in love. Enjoy at dinner with the windows open, and a glass of crisp white wine (or kombucha, or tea, or sparkling water, depending on your sip of choice), or for lunch the next day! Either way, you’re getting a whammy of yummy health benefits. The salad is filled with nutrient loaded ingredients, while the salmon holds a hefty dose of omega 3s, vitamin b, and antioxidants. Bonus points? The skyr in the dressing is packed with protein and calcium and the kefir provides a healthy dose of probiotics. Indulge in a creamy and delectable potato salad with real ingredients that you can feel good about putting into your body, while also resting easy knowing that this dish is great for the ‘gram. Prep: Place the potatoes in a large pot and cover with 2 inches of water. Add 1 tsp of salt and place over high heat. Bring to a boil, then cook until the potatoes are tender, around 10 minutes. In a separate pot, add the green beans to the boiling water and simmer until bright green and tender-crisp for around 2-3 minutes. Drain the green beans and rinse them with cool water to stop the cooking. Place the eggs in the saucepan and cover with water over medium-high heat. Bring to a rolling boil. Remove from the heat, cover, and let stand for 5–6 minutes. Drain the eggs and add ice and cool water to the pot to stop the cooking. For the salmon: Season the salmon with salt and pepper. Heat a tablespoon of olive oil over medium high heat in a cast iron skillet or pan. Add the salmon and get a good sear on both sides, around 6 minutes on each side. Lower the heat and continue to cook, covered, until just cooked through. For the dressing: In a food processor, combine the herbs, garlic, salt, lemon, skyr, kefir, and mayonnaise—blend until just smooth. Adjust with extra salt and pepper as needed. For the salad: To assemble, place the cooled potatoes in a large bowl. Add the green beans, cucumber, red onion, chives, and 1/2 cup of the dressing. Toss together gently to combine. Add more dressing as desired. 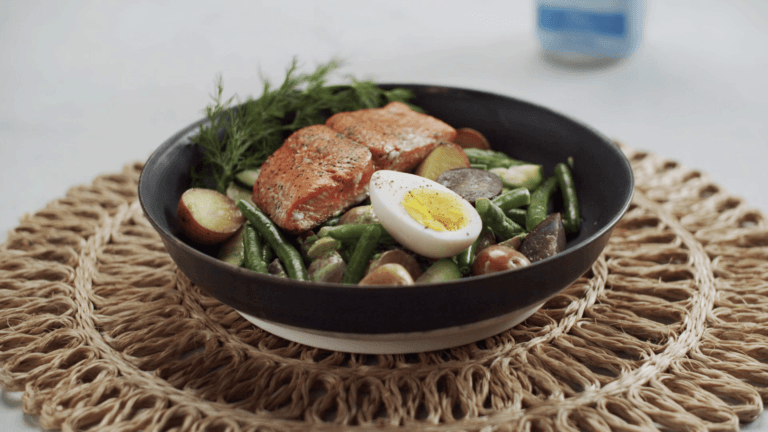 Chop the salmon and eggs into the salad or place them on top of the salad. Garnish with dill and serve immediately.